SETEC presents its new automatic plaster preparation line for DGAUT6 sanitary molds. The fully automated line, from the loading from storage silos to the transport of the finished product to the casting of the dies, has as main characteristic the management of all the production parameters managed by PLC. The type and number of recipes to be set, allows a great flexibility to achieve totally customized blends to be used for different needs and solutions. The automatic management of dosing and mixing water temperature is one of the great advantages also and above all for those who produce plaster molds for spag-less casting. The extreme precision of the dosing instruments, the accuracy of the management software as well as an extreme care of the mechanical-structural part, make the system extremely flexible and effective. In the production of gypsum mixtures for the construction of spagless type molds, it is possible to set recipes that allow the determination of the parameters necessary to achieve the porosity characteristics to which it is desired to work during the casting phase. This peculiarity represents a great advantage in the management of the life of the mold and a quality of sanitary molded by casting that is clearly superior to the standards. 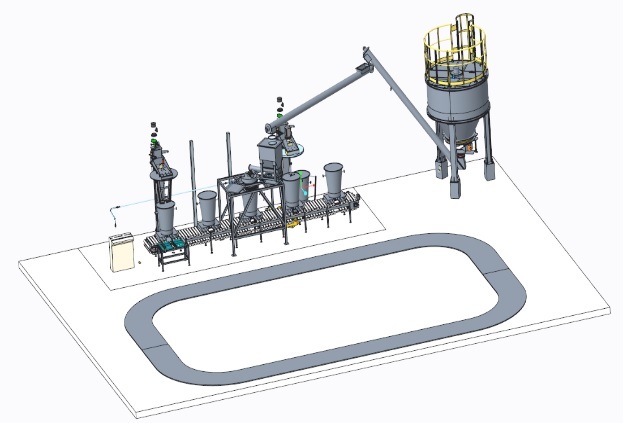 The plant works in automatic sequence producing the required mixtures that are subsequently discharged by the appropriate containers in the matrices placed on a special casting carousel. The plant can work according to requirements by varying the quantities to be produced, increasing or decreasing the volumes according to the setting. It also has a carwash system for containers containing the mixture of gypsum, which does not affect the continuity of the production cycle. The system can be customized according to different needs.